There is a yearly $50 registration fee per family. See our Tuition Chart on our website www.FullOutFamily.com to calculate your tuition for multiple classes or for multiple students. Or you can email Info@FullOutFamily.com for assistance. There are huge discounts for multiple class registration and also for multi student families! Discounts will be applied automatically after registration is submitted. Mulit Class and Multi Student discounts will be applied automatically after registration is received. Your card will NOT be charged when you submit this registration form. The fee will be posted to your parent portal account and payment will be due within one week from this date. If you wish to cancel this registration after it has been submitted, you MUST EMAIL Info@FullOutFamily.com to cancel this registration. 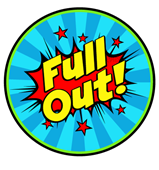 I am aware that I must notify the office, by email to Info@FullOutFamily.com, before the 1st of the month regarding any change in my child's class registration. If my child discontinues a class or discontinues coming to Full Out all together and I do not notify the office by email before the 1st of the month, I understand that all current and any past due tuition will be due immediately and my card on file will be charged for the aforementioned tuition fees. I understand that I am liable for tuition under the terms of this contract and I am liable to pay any and all legal fees and court costs incurred by Full Out Studios LLC. in the event that I do not pay my account balance or in the event of court proceedings for any other matter. I am also liable to pay any and all collection agency fees in the even that I do not pay my account balance in full. As the legal parent or guardian, I release and hold harmless Full Out Studios LLC, its owners and operators from any and all liability, claims, demands, and causes of action whatsoever, arising out of or related to any loss, damage, or injury, including death, that may be sustained by the participant and/or the undersigned, while in or upon the premises or any premises under the control and supervision of Full Out Studios LLC, its owners and operators or in route to or from any of said premises. As the legal parent or guardian, I release and hold harmless Full Out Studios LLC, its owners and I, the adult applicant or I, the parent or legal guardian of the applicant listed above, hereby give approval of the applicant's participation in any and all Full Out programs and activities. I do waive, release, absolve, indemnify and agree to hold harmless the organizers, sponsors, supervisors, participants and persons involved in the operation of Full Out programs for any claims arising out of injury, death or other loss to named applicant or any member of his/her family whether as a participant in the activities or as a spectator on or off of Full Out premises. I also give permission for Full Out to take photos of me or my child to use for the website and for purposes of promoting the studio. If any child exhibits behavior that is dangerous to herself/himself or to other students, Full Out Dance, Cheer & Gymnastics reserves the right to remove the child from the studio/gym. There will be no refunds given for any reason. The undersigned gives permission to Full Out Studios LLC, its owners and operators to seek medical treatment for the participant in the event they are not able to reach a parent or guardian. I hereby declare any physical/mental problems, restrictions, or condition and/or declare the participant to be in good physical and mental health. In order for us to keep our tuition low for all attending Full Out, we have a strict "Credit Card on File" policy. Everyone will be required to have an active and up to date credit/debit card and bank draft on file with us. You may set up automatic payment by logging into your customer portal. Click on the "My Account" tab and select "Auto Charge - 1st of the Month" next to " e-Payment Schedule:". By setting up automatic payment, either through debit/credit card or bank draft, your tuition will be taken care of automatically on the 1st of each month. This is the best way to avoid any late fees. If you choose not to set up automatic billing you are responsible for making your payment through cash, check or money order by dropping payment in the payment drop box in the lobby or by credit card through your parent portal. Tuition is due on the 1st of the month. All accounts with a balance on the 8th of the month will be charged a $10 late fee. Accounts with a balance on the 15th of the month will be charged an additional $5 and the card on file will be charged. If you receive an email confirming payment after the 14th of the month, you are not enrolled in auto pay. In order to receive the $5 discount, payment must be made by cash or check only and placed in the drop box in the lobby before the 1st of the month. You can also do this even if you are signed up for auto pay. If check or cash is received before the 1st of the month then your auto pay will not go through that month and you will receive the $5 discount. You can use auto pay as a back up to not receive late fees if you forget to drop a payment in the box. The fee for a bounced or returned check is $30.00. I hereby authorize Full Out Studios, LLC ("Full Out") to debit my (our) account for any balance due on the 15th of each month or thereafter, including late fees, as such amounts become due by initiating debit entries to my (our) account indicated in the bank (hereinafter called "Bank") or to my (our) credit/debit card number indicated below. I (we) authorize and request Bank to accept any debit entries by Full Out to such account and to debit the same to such account without responsibility for the correctness thereof. I (we) agree to indemnify and hold Bank harmless from any loss suffered as a consequence of actions resulting from or connected with or issuance of a debit. This authorization is to remain in full force and effect until Full Out has received written notification via email from me of its termination in such time and in such manner as to afford Full Out and its depository bank a reasonable opportunity to act on it. I agree that Full Out reserves the right to correspond in all matters regarding fees via e-mail.